Forest2Market was founded in January 2000 to empower participants in the global forest, wood products, paper products, biochemical and bioenergy industries to make exponentially better decisions through the strategic application of industry expertise and unique datasets. Forest2Market believes the only way to achieve a true measure and understanding of the market is to collect transactional data. The foundation of all Forest2Market products and services is our unique, current and proprietary database of delivered wood raw material transactions and the underlying extensive data collection infrastructure that enables us to collect millions of market transactions every year. Forest2Market is a neutral third-party, independent in ownership and structure. While actively involved in the industries we serve, we do not buy or sell timberland, timber, lumber or biomass. 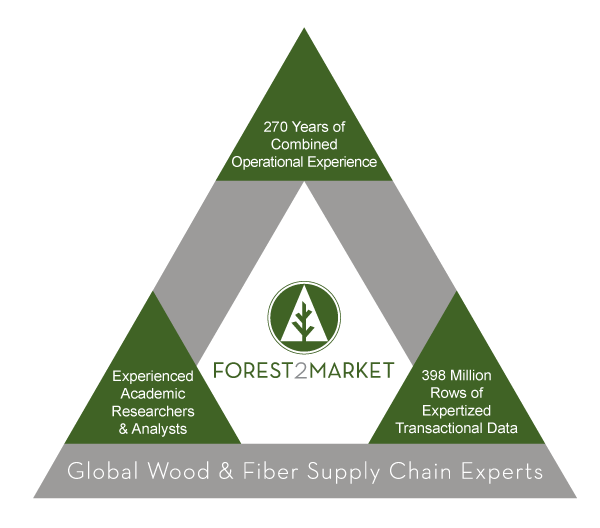 Forest2Market has built a comprehensive set of products and services that address the complex issues of forest and fiber supply chain management. Our customers use our subscription services and custom analytics to make better-informed strategic and operational decisions. Forest2Market was founded in 2000 and began by collecting transaction-based data and developing a Stumpage Price Database for the US South. That database now contains 16 years’ worth of data and is updated on a real-time basis and available 24/7/365. In 2007, Forest2Market developed the Wood Raw Materials Benchmark for the US South, making it the only transaction-based mill-to-mill benchmark that quantifies total delivered price and the cost components of the raw material supply chain. By quantifying stumpage, harvesting, freight and overhead costs, Forest2Market provides unprecedented insight into the wood raw material supply chain. The Delivered Price Benchmark has been expanded to include the Pacific Northwest (2008), the Great Lakes (2012), the Northeast and Eastern Canada (2013), and Brazil (2013). A European benchmark focusing on the Baltic Region and Russia is in development and is expected to be published in early 2017. Based on this transactional data, Forest2Market produces timber price forecasts and supply chain optimization tools and performs a range of client-specific resource studies for project development or acquisition and timberland acquisition and divestment.